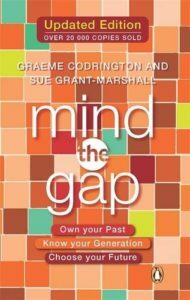 “Mind the Gap” is for you if you want to know why: Your 18-year-old son isn’t interested in being a doctor – he wants to save the whale; your grandfather gives you Big Band CDs for your birthday; your secretary knows more than you do; your grandson calls you Peter instead of granddad. In short, this title aims to promote understanding between the generations. This is vitally important in all of our relationships, especially in the workplace. Application chapters focus attention on: work, marketing and advertising, leadership, teamwork, finances, parenting, education and training, “retyrement”, travel, politics, faith, health, and home. Still a best selling book, with five star reviews! This edition has been fully revised, expanded and updated. With all new chapters on the next generation, generations around the world and more, as well as new information and updated insights based on 10 years of applying generational in companies and organisations in over 50 countries. NOTE: The first edition of the book was re-issued with a different cover design in late 2010.